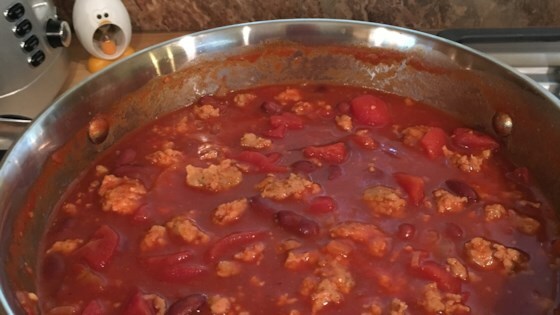 "This chili was a fun experiment that my kids gave 5 stars! Rhubarb is very popular in desserts and should make an appearance in a main dish occasionally. Serve with your favorite chili toppings, or eat on its own." Heat olive oil in a large pot over medium heat. Add rhubarb, onion, red bell pepper, and salt; cook and stir until tender, about 5 minutes. Add ground turkey and garlic and cook until turkey starts to brown, about 5 minutes. Stir chili powder, cocoa powder, white sugar, cumin, cinnamon, allspice, and cayenne pepper into the pot; cook and stir for 3 minutes. Add blacks beans, diced tomatoes, and corn; mix well to combine. Bring chili to a boil, reduce heat and simmer, covered, until thickened and flavors are combined, about 30 minutes. Season with salt and black pepper. Substitute ground beef for the turkey if preferred. Because this is a thick chili, make sure to keep the lid on while it simmers. I used one small can diced tomatoes and one small can of fire roasted tomatoes with green chile's in addition to two very coarsely chopped fresh tomatoes. This is very easy to put together.